I can never get enough of the beautiful vegetables of spring. They are just my absolute favorites. 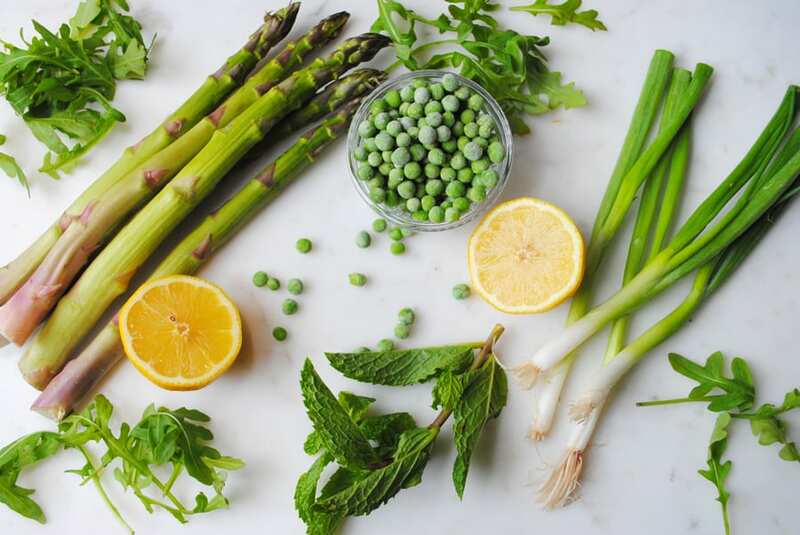 Peas, asparagus, green onions, fresh herbs are just starting to make their way to the market too. Suddenly the darkness of winter is replaced by the vibrancy of spring, and my heart is SO happy. I love all of the seasons, I really do, but by the end of one season I am usually ready for the next. I get inspired with each one, I need the change so that I too can change. But with spring well, I am never happy to see spring go, it seems so fleeting and fast. 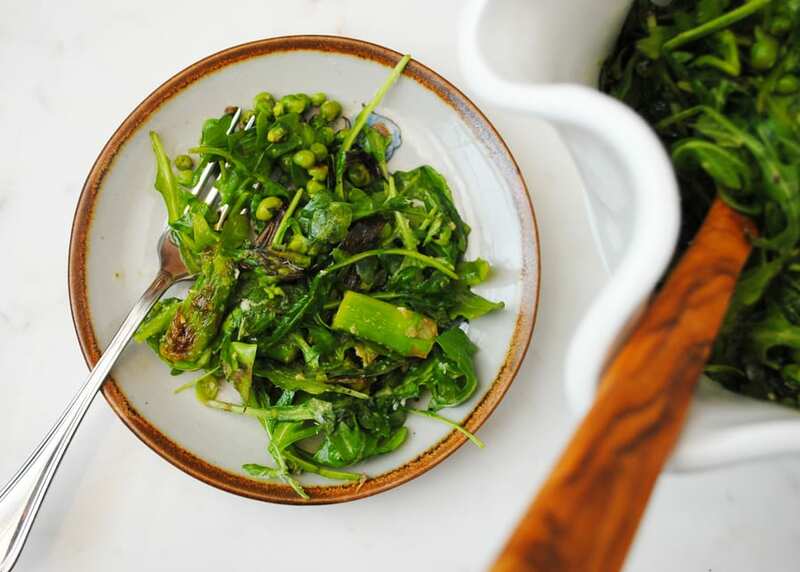 This Spring Green Charred Salad is full of incredible spring flavor. It’s a great salad that pulls together very easily. 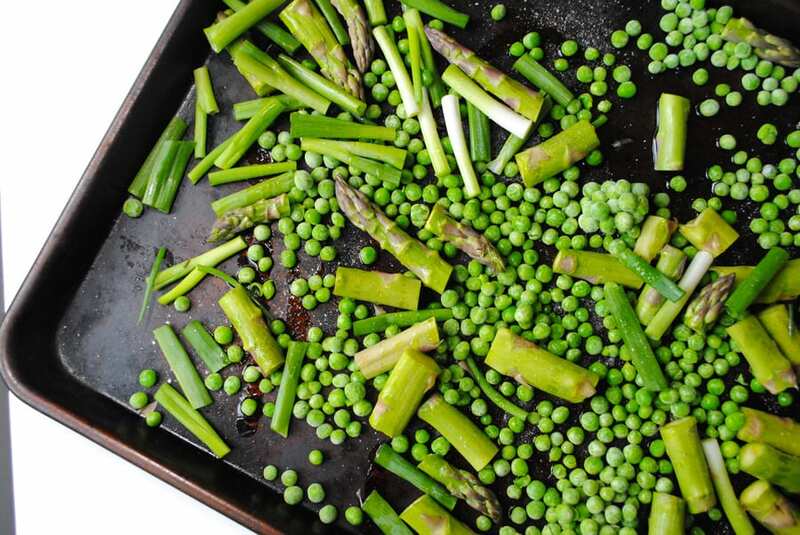 I toss chopped asparagus, green onions, and frozen peas (or fresh if you can find them) on a sheet pan and roast them in the oven until a nice little char develops of some of the veggies. Then the warm veggies get tossed with baby arugula, lemon juice, Parmesan cheese, and fresh herbs. It’s a great salad to break up the norm, and I love serving it with fish, or grilled meat. If you are not a fan of arugula you could substitute in spinach. Basically any green that will wilt slightly with the warm vegetables. 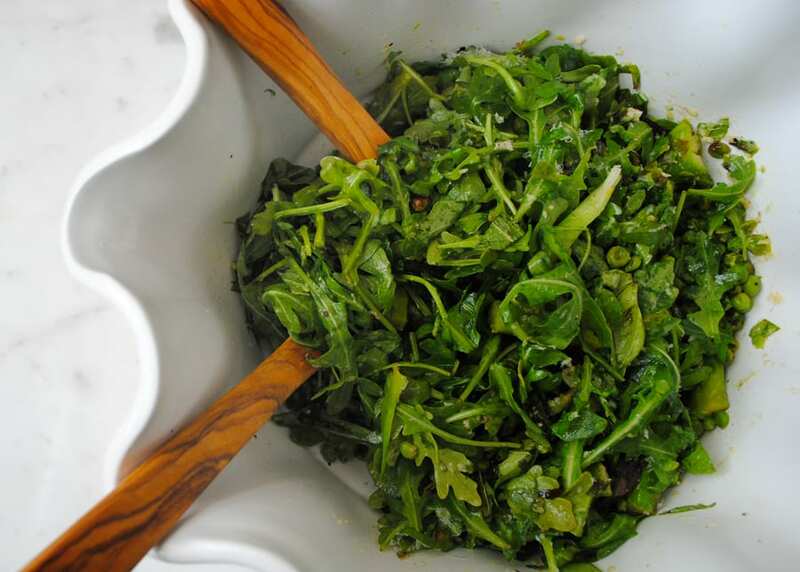 I love the peppery bite of arugula and think it compliments the fresh lemon juice very well. On a sheet pan toss the asparagus, peas, and green onions with 1 tbsp olive oil and sprinkle with salt and fresh pepper. Roast for about 15 minutes or until the vegetables just begin to brown. Toss the warm vegetable in a bowl with the arugula, mint and basil. Sprinkle the 3 tbsp olive oil and lemon juice over the top. Toss in the Parmesan cheese.